with company work recently, sipet tulan. Ya know, cibailang also gotta work one ma.. But sometimes gotta do posting also, kenot let cibaiHuat do only. cibailang.com) has created a cibai game which we named it LeoKu May Cry and you all need to run. Here’s the box frontpage and some screenshots taken from the game, enjoy! 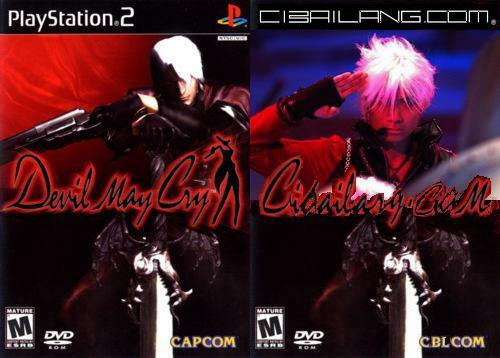 The one on the left is Dante, he is the main character in Devil May Cry, another similiar game created by which is our main competitor in YOU_NAME_IT May Cry gaming series. Here comes the two main characters of each game, tiewing each other. Dante on the left while Leo on the right. Fire fighting each other, like my company people. Wah! Somemore wanna headshot people. If you’d care to comment on a retarded blog? I wonder how smart you are at the first place ? Hihi … get this url from Matt. It’s very funny lar .. all cibai cibai .. hahaha ..
walao, like that also can? TL, this one suit your website..
come on….tis cibai idea jz cibai lang can onli think of…. lolz… i wan buy dat cibai game…. gt psp platform??? cibai baka…. mai think u can spam in here…. lolz… come in CBL spam comments… dun think i dunno lo.. go sch gv u die ar….